Triassic period was named in 1834 by Friedrich August Von Alberti (1795-1878). Named from “Trias” which means three. Yes, the Triassic represented by three-part division of rock types in Germany. There are Bunter (brown sandstone, red beds), Muschelkalk, and Keuper. The Triassic Period was started about 248 million years ago, where the Permo-Triassic extinction occured. In that time, there is the largest extinction known, almost 70% genera died, and 95% of all species died out. Not only land animals, but also many under-the-sea animals. 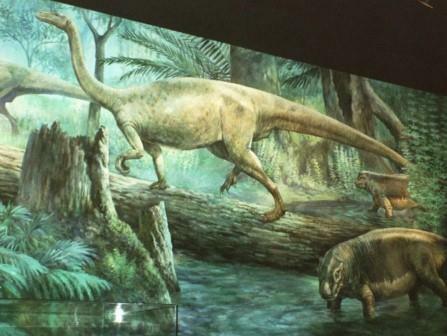 There were no dinosaur at the beginning of Triassic period, but starts from there, there were many reptiles,dicynodonts and amphipians are starts to develop. The corals and everything on the Earth were recovered from the Permo-Triassic extinction. Glossopteris was the dominant plant in that time. This plant was dominant in the southern continent, called as Gondwana. 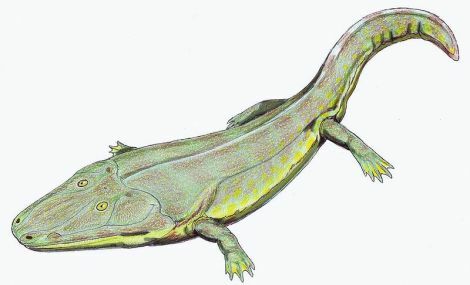 During the Triassic period, Eozostrodon was the first mammals. Some scientists believe that the mammals were evolved from the extinct mammal-like reptiles like Therapsids. There were detected the first-turtle too, called as Proganochelvs. 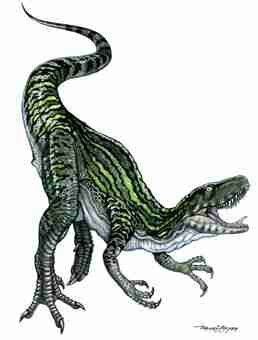 Other creatures that lived in Triassic Period are Turtles, Salamanders, Lizards, and Pterosaurs. The Ancestor of Archaeopteryx was appeared, named as Pseudosuchia. Aetosaurs like Desmatosuchus also lived in the same time. 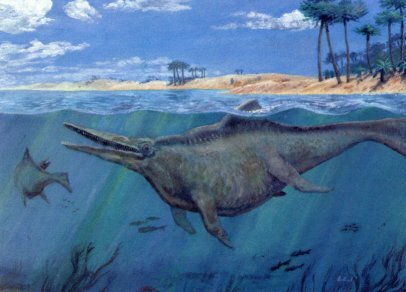 Under the sea, the first marine dinosaurs, Ichtyosaurs appeared. The Triassic’s climate was generally dry and hot. Pangaea super-continent formed mountains and decreased the amount of shoreline. It gave Pangaea desert-alike terrain. It’s so hot and dry. The Scientists believe that Triassic period ended by a huge volcanic eruptions about 207-212 million years ago. The Pangaean continent breaks into many parts. About 35% animal die and extinct. Primitive dinosaurs were extinct too, but remaining dinosaurs evolved to be more adaptive in the next era, the Jurassic Era. This extinction made dinosaurs as the dominant , abundant and diverse creatures to “rule” the Earth for the next 150 million years.